Pavilian at Yeonjuam Hermitage. Founded as Gwanak Temple by the Great Hwaeom Priest Uisang in 677. Hwaeom is the Korean name for the Flower Garland school of Buddhism, best known as the Huayan school of Chinese Buddhism that developed as part of the Mahāyāna branch. Buddhism first began in India, and as it spread to other areas, distinct branches developed. The Mahāyāna branch developed in China, and is found today primarily in China, Taiwan, Japan, and Korea. In Korea, the major schools in the Mahāyāna branch are the Zen or Seon School, which focuses on meditation; the Pure Land or Jeongto School and the Hwaeom School, which emphasizes doctrine. Buddhism entered Korea from China in the fourth century, and developed its own character, influenced by elements of Shamanism, Korea's indiginous religion, and guided by great teachers who arose among Korea's Buddhists. Wonhyo (617-686) sought to eliminate disputes about which doctrines are superior to others by teaching that doctrines are not an end in and of themselves, but a way to lead believers to understand that the world is temporal; that all phenomena are products of the mind. He was also committed to making Buddhism approachable for all people, not only the aristocrats; he worked to make Buddhism practical so that the common people could understand it too. The result of Wonhyo's influence on Korean Buddhism produced Tongbulgyo or interpenetrated Buddhism. About the same time, Uisang (625-702) returned from in 671 China bringing Huayen Buddhism, which he had been studying with Zhiyan. Uisang's vigorous work to establish the Hwaeom school on the Korean peninsula led the Korean Hwaeom School to become the strongest embodiment of Hyuyen Buddhism anywhere. Uisang's work was greatly aided by the powerful influences of his friend Wonhyo, who although not an official representative of the Hwaeom school, relied deeply on Hwaeom metaphysical principles to establish his concept of interpenetrated Buddhism. Central to Huayen Buddhism, or Hwaeom, as it is called in Korean, there is a harmony and universal order to the world, and if a person is able to recognize that order, all conflicts and tensions are eliminated. 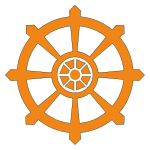 Three main symbols of the core of Hwaeom thought are Taeil Yorae (Mahavairocana), the symbol of light, Kwanum Posal, the Bodhisattva of compassion (Avalokitesvara) and Munsu Posal, the Bodhasattva of wisdom (Manjusri). Statues of these three can often be found in the main hall of of buddhist temples, with compassion on the left and wisdom on the right with Taeil Yorae in the middle. Pagoda at Yeonjuam Hermitage on Mt. Gwanak. The teachings of the Hwaeom sect are based on the Avatamsaka Sutra, also known as the "Flower Garland Sutra." The Avatamsaka Sutra was delivered by Sakyamuna Buddha soon after he ascended to spirit after attaining Buddhahood. The sutra includes Ten Grades of Faith, Ten Stages of Wisdom, Ten Activities, Ten Transference of Merits, Ten Stages of Bodhisattvas, teachings about enlightment, about developing as a Boddhisattva, and about how to enter Buddha's world. Many people consider the Avatamsaka Sutra the most advanced of all of Buddha's teachings. The writing occupies 81 bamboo scrolls and contains more than 700,000 Chinese characters. After the passing of these two early monks, the Hwaeom school became strongly established under the influence of a long series of Hwaeom masters, and Buddhism was one of the forces that united the country during the Unified Silla period (668-935). Buddhist rituals were used to protect the peninsula, and the presence of the Bodhisattvas of compassion and wisdom were felt in many places. Many of Korea's most important temples were built during this period, and many beautiful statues, pagodas, and Buddhist art works were created. The Hwaeom school remained in the position of predominant doctrinal school in Korea throughout the up until the middle of the Goryeo period (935-1392). Contemplative Seon Buddhism had entered from China in the preceding centuries, and under the influence of Master Uichon (1055-1101), the son of King Munjong, the emphasis in Korean Buddhist practice shifted from rituals toward meditation. Uichon brought together the contemplative Seon and doctrinal Hwaeom schools and created a new school he called Cheontae. Later in the Goryeo period, Songgwang Temple was founded on Mt. Jogye, and starting from that time the Jogye order, part of the Seon School moved into the dominant position. Within the Seon school, Hwaeom thought would continue to play a strong role, and continues as such to modern times. Hwaeomsa Temple, founded in 544. Originally a central temple in the Hwaeum sect, now a Jogye Order head temple. Seukbulsa 석불사 is currently the head temple among the active temples in the Hwaeum sect. Located in North Cholla province in the city of Iksan, near the site of the former Mireuksa Temple, Seukbulsa Temple is the best surviving example of a Baekje period temple and houses a stone statue of Buddha that dates from the Baekje period, and is a registered national treasure. Gwangcheonsa (광청사 光淸寺), formerly known as Jeongsusa, is located in South Gyeongsan province on Mt. Ipsan, and at its peak was one of the four major temples in the province. It is not known when the original temple was built on the site, nor exactly when it fell into ruins. In 1623, a temple was rebuilt on the same site with the name Jeongsusa, which also fell into ruin. In 1980, construction began on the current temple, Gwangcheonsa. Beopwangsa 법왕사(法王寺) is located to the east of Yeon-gyeong Palace in the city of Kaesong, on the border of North and South Korea. Founded in 919, Beopwangsa was one of the 10 major Hwaeom temples designated by King Taejo of Goryeo, and for many years the favored location for the annual Palgwanhwe Ceremony, officiated by the King to honor local dieties. King Gyeongjong visited in December 981, offering incense to separate himself from turbulent decadence and gambling that was prevelent in the kingdom. Kings Mokjong and Jeongjong also visited the temple for the Palgwanhwe, as well as many succeeding kings, all the way through King Gongyang in 1391. With the start of the Joseon period, and the shift in emphasis from Buddhism to Confucianism, the temple fell into disuse, and was never revived. Hwaeomsa 화엄사 (華嚴寺) is located in South Cholla Province, on Mt. Jirisan. Founded in 554 by Master Yongi, Hweomsa was expanded in 634 by Master Uisang during the period when he introduced Hwaeom Buddhism to Korea. After being destroyed in the Hideyoshi invastion at the end of the sixteenth century, it was rebuilt under King Injo in 1630. Hwaeomsa is now a headquarters temple in the Jogye Order of Buddhism. Beopwangsa보천사(寶泉寺), located in North Cholla Province on Mt. Chukseong, was built in 602, and reconstructed in 1352. In 1924, the treasures of the temple, including the statues of Buddha, were taken to Japan. In 1936, construction was started on a new temple at the site. In 1971, Kim Mu Jin became the Chief Priest at Bocheonsa and led a reconstruction of the main hall. Yaksasa 약사사(藥師寺), formerly known as Juansa and Jubyeongsa, is located in the city of Incheon, on Manwol Mountain. The origins of Yaksasa are unknown, but it was built sometime before the beginning of the Joseon period. It is mentioned in Dongguk Yeoji Seungram, published in 1481, and Beomwoogu (1799) states that the temple has fallen to ruins. In 1932, reconstruction was started on the site, and the temple was named Yaksasa. In 1966, Han Junha was installed as Head Priest, and the temple reverted to the Hwaeom Sect. Ilgwangam 일광암(日光庵)is one of several temples located in Wansan gu in the city of Jeonju in North Cholla Province, believed to have been built in the early part of the Goryeo period. Ilgwangam was reconstructed in 1933, and is now operated as part of the Hwaeom sect. Hyebongwon 혜봉원(慧峰院), formerly known as Samgonsa, is located in North Cholla province in Mohyundong. Hyebongwon was founded in 1894 by 3 Buddhist nuns, including Gangmosihwa, praying to the merciful heart of Buddha, and it was named Samgonsa. After the condition of the temple had declined, in 1955, Priest Hyebong Ha Kyuho was appointed temple head and began restoration work, and the temple was renamed Hyebongwon. The temple houses a five-story pagoda and a lotus pedestal that is registered provincial treasure No. 13, and was brought to Hyebongwon from Bocheonsa in Gunsan city. This page was last modified on 20 January 2018, at 16:46.